Here is the 2016 Toronto Maple Leafs Qualifying Tournament in its entirety. The 3rd-seeded ’47-’48 Toronto Maple Leafs are now the third different team that will have represented the franchise in the Ultimate NHL Playoff. Their sweep of the top-seeded ’50-’51 Toronto Maple Leafs began with a 5-4 win in Game 1. A PP goal early in the third from Tod Sloan gave the ’50-’51 Maple Leafs a 4-3 lead. However, the ’47-’48 Maple Leafs tied it five minutes later before Nick Metz scored the game-winner with a little over four minutes left. 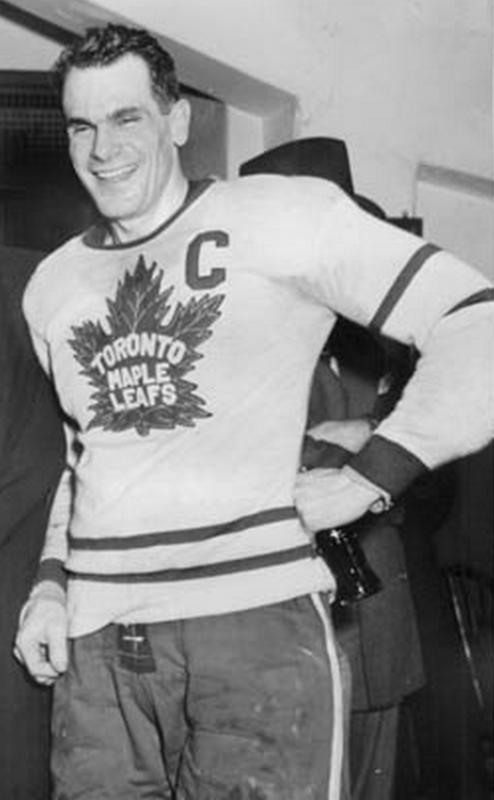 The captain of the ’47-’48 Maple Leafs, Syl Apps, posted a goal and two assists to lead the way offensively. Then, behind an incredible 51-save shutout from Turk Broda, the ’47-’48 Maple Leafs took a 2-0 series lead with a 1-0 win. Apps scored the only goal in the game, but it was Broda who shined with his 51 saves. Apps then got the scoring started in Game 3 halfway through the first period and they would eventually win 5-1. Defenseman Jimmy Thomson pitched in from the blueline with a pair of assists while both Apps and Bill Ezinicki had a goal and an assist each. The sweep was completed with a 3-2 win in Game 4 for the ’47-’48 Leafs. Apps, once again, led the way offensively, with a goal and an assist, again. After Game 1, Broda stopped 116 of 119 shots against, which is a .975 save percentage, which is ridiculously good. Up next….to conclude the Qualifying Tournament part of the season….is the 2016 Montreal Canadiens Qualifying Tournament! This entry was posted in Qualifying Tournament, Ultimate NHL Playoff and tagged Bill Ezinicki, Jimmy Thomson, Nick Metz, Qualifying Tournament, Syl Apps, Tod Sloan, Toronto Maple Leafs, Turk Broda, Ultimate NHL Playoff. Bookmark the permalink.